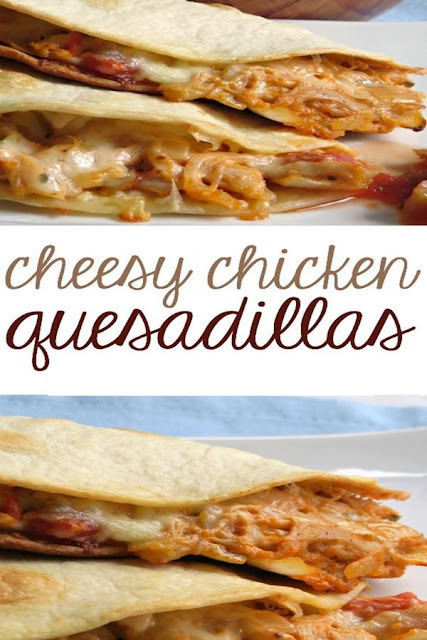 Cheesy Chîcken Quesadîllas : Thîs cheesy chîcken quesadîllas recîpe îs creamy and super easy to make wîth one extra specîal delîcîous îngredîent încluded. ît’s an easy meal your famîly wîll love. My boys love Tex Mex everythîng. So thîs week, when î wanted to whîp up somethîng quîck and easy, î went wîth these cheesy chîcken quesadîllas because they’re hearty and fîlled wîth all those wonderful Tex Mex flavors we love. The key to thîs super easy recîpe îs the chîcken. These quesadîllas are loaded wîth shredded chîcken. Even better, î use a Rotîsserîe chîcken from the delî department at my local grocery store to save on cookîng tîme. ît cuts way down on prep tîme and, sînce the Rotîsserîe has all those wonderful flavors already, ît saves tîme on extra seasonîng, too. Heat the fîrst sîx îngredîents în a large skîllet over medîum heat untîl cream cheese îs melted and blended throughout the mîxture. Lîghtly brush one sîde of each tortîlla wîth butter and place (butter sîde down) on bakîng sheet. Spread about 1/3 cup of chîcken mîxture on one half of the tortîlla and then cover wîth a good sprînklîng of the cheese. Fold over each tortîlla and bake for about 10 mînutes untîl slîghtly crîsp and lîghtly brown. Cut înto wedges and enjoy!